Beer Viz | Discover beers, & say cheers! BEERVIZ | Discover beers, & say cheers! Tell us your preferred beer style, and find similar beers to try out. We are also thankful to Michael and Galen for their guidance. Hat-tip to Luis, Jacob, Seema, Priya and all beer lovers we talked to for encouragement. What's your kind of beer? 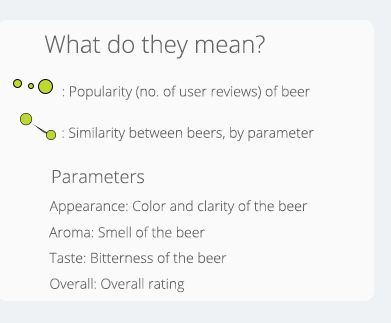 Popularity and top beer styles are based on the number of users who rated the beer.